I’m sure you’ve heard the phrase “walking encyclopedia” to describe someone with a vast amount of knowledge. You’d be hard pressed to find somebody more suited to this moniker than Gil Marks, author of The Encyclopedia of Jewish Food. Gil may be considered the world’s foremost expert on the history of Jewish cuisine. He has made culinary history his life’s work, studying the origins and evolution of the foods we eat. Gil is a James Beard Award-winning author of several cookbooks, including Olive Trees and Honey – A Treasury of Vegetarian Recipes from Jewish Communities Around the World. The Encyclopedia of Jewish Food was published only two years ago, but it has made a significant impact on the food history landscape. In fact, I just found out via Facebook that the Encyclopedia is now on display at the Library of Congress as a significant cookbook! What an honor, and so well deserved. 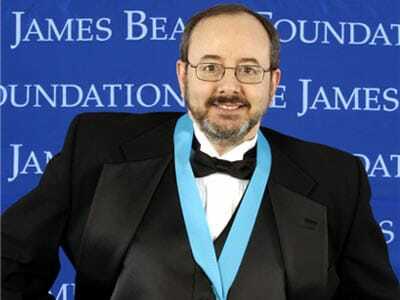 Gil Marks after winning his James Beard Award. I had the pleasure to speak with Gil recently about his work, his upbringing, and his career in food. The interview appears below. 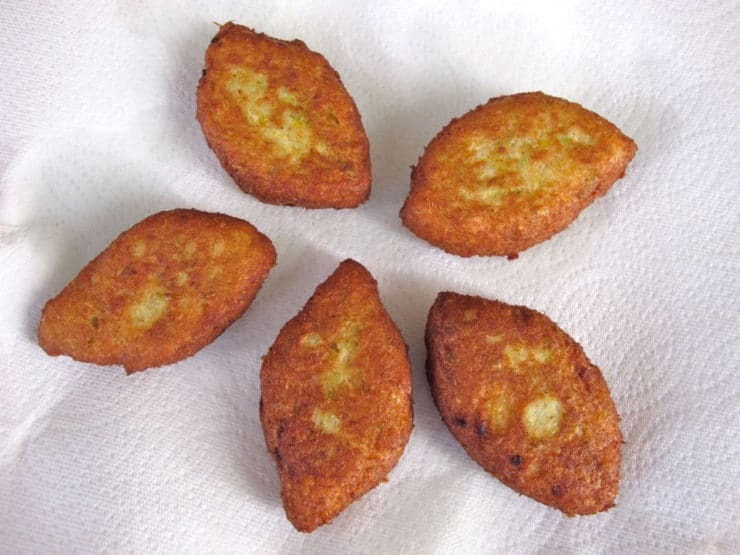 After, you’ll find an absolutely delicious recipe for Keftes de Prassa – Sephardic Leek Fritters from The Encyclopedia of Jewish Food. They’re a traditional Sephardic dish for Rosh Hashanah, and they’re amazingly tasty. You will love them! Where did you grow up, and what is your ancestry? I grew up in Richmond, Virginia. My father’s side of the family is Romanian, and they’re long time Americans, they came here in the 1880s. My mother’s side of the family is an interesting split between Lithuanian and Belarusan. What kinds of foods did you grow up eating? I grew up in the South, so I grew up eating typical American stuff, as well as iconic Ashkenazi Eastern European fare, and also Southern food. I had a diverse palate because of where we lived. How did you get started in the area of food history? I will tell you one thing, my mother claims full credit for my career. She tells everybody that when I was a little boy, I used to complain about her food all the time. She said, “Well if you don’t like what I make, make your own.” I was the type of kid that did, and as with any skill, once you overcome the initial intimidation and learn a few basics, then anybody can master it and grow it. So that’s how I got started. I’ve never taken a cooking class in my life. I’m all self taught. If something interests me, I explore it and try it and develop it, then move on to the next thing. One of the things I did as soon as I got my first computer, about 20 years ago, I started collecting information. So every recipe I tried would go into the computer, and all of the research would go in. So over 15 – 20 years I had collected a lot, and it gave me some of the basis to go with for the encyclopedia. Then it was just a matter of checking the accuracy and making it as comprehensive and accurate as possible. How do you go about verifying the accuracy? Much of what we think about food can be erroneous. A lot of the things we read about food are just bubbe meises, which is Yiddish for old wives’ tales – bubbe as in bubby, or grandma, and meises means tales. But whether it’s Jewish food or generic American food, much of what is assumed to be the historic fact is just bubbe meises. And that’s kind of what I do in my work, I try to look and see the difference between how things developed, what they are and what they were. Just to give you a Rosh Hashanah example, lekach, the Jewish honey cake, is mentioned already in the year 1290. As with many medieval food innovations, it comes from the Islamic world. It came to Italy first, because those are the port cities and the main trade cities, and then later showed up in German fare. But the honey cake of that period was totally different from what we eat today. Gingerbread and honey cakes in the Elizabethan period were made with breadcrumbs instead of flour. So when you’re talking about gingerbread or honey cakes before the 1700s, you’re talking about a confection, like a panforte. Totally unleavened. And you only begin adding eggs and flour in the 1700s or so. The honey cake that we eat today developed in the late 1900s with the infusion of baking powder and such. The use of chemical leavenings like baking powder and baking soda is a very American innovation. Another bubbe meise– Irish soda bread is not Irish. It was invented in America, just as corned beef and cabbage came from America. The problem is that the language changes as dishes evolve and change over time. So the lekach of the 13th century is totally different than the lekach of the 20th century. Same thing with cinnamon. The modern cinnamon which comes from Sri Lanka has nothing to do, other than in name, with biblical cinnamon. It was just probably a medieval marketing ploy—when cinnamon showed up in the medieval period, somebody said, “Well what do we call this thing?” and probably some guy said, “Oh look, we have this biblical spice that nobody uses or knows what it is anymore, we’ll just call it cinnamon.” And so we just assume, but the truth is that most Americans have never tasted real cinnamon. When it comes to Jewish food, you literally wrote the encyclopedia on the subject. 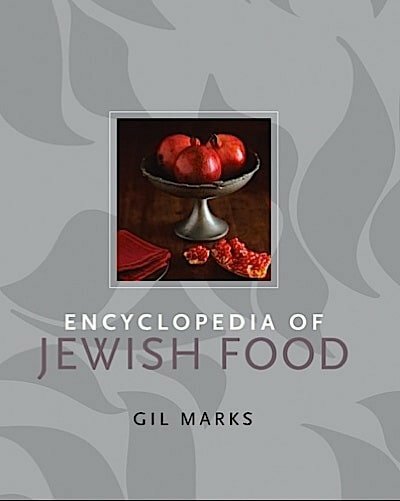 How long did it take you to put together The Encyclopedia of Jewish Food? Well, it took me my entire life in some ways, because it’s a compilation of all the research I’ve done throughout my life. After I did Olive Trees and Honey, which was so successful, I was talking with my editor at Wiley about what to do next, and he said, “Look, you’re a walking encyclopedia of food, so why don’t you just write one?” And I did. It took about 5 years from that point until it came out. My next book is about American cakes. It’s a history of America, through cakes. And going back to the idea that much of what one assumes about American food is often erroneous. When did you ultimately decide to pursue a career in food? I didn’t go into this because I had to, I did this because I wanted to. I was working at a high school and I was very unhappy—not because of the kids, but because of the administration. I said to myself, I don’t want to wake up 10 years from now wondering why I’m doing something that makes me absolutely miserable. I knew I liked to write, I liked to cook and I liked everything about food. So I put those together and started Kosher Gourmet Magazine. Which was I guess in ’86. That was the very beginning of the movement of kosher food into quality. America was just starting to bring in some of the quality wines from Europe and stuff. So we lasted for about 6 years, then I segued into the books, and now I’ve got five of them and three James Beard nominations. I never planned to have a food career. It just came about, and in some ways it was one of these divine providence things. I thought I was going into community social work, some sort of communal Jewish organization. But I ended up teaching more people, I guess, through my food writing than I would have otherwise. I can really identify with that. I’ve always loved food and cooking, but I never expected to have a career in food. It seems like the stars aligned. That’s life. It sometimes takes us where we’re meant to be. It’s not always where we want to be. But where I end up is always better than where I wanted to be. So I can’t complain. Most people love to get away from their jobs and would never take their computer with them on vacation. I never go away without my computer. This is my fun. Putting pieces together, trying new things and experiments and figuring out these historical puzzles, what foods really are and where they came from. That’s my fun. If you’re watching your sodium intake, you can cut the salt to 1/2 tsp and still get a terrific flavor result. Enjoy! 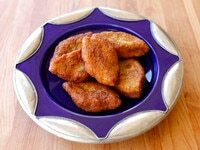 An interview with Gil Marks, author of The Encyclodedia of Jewish Food, & his recipe for Sephardic Leek Patties. Kosher, Rosh Hashanah. 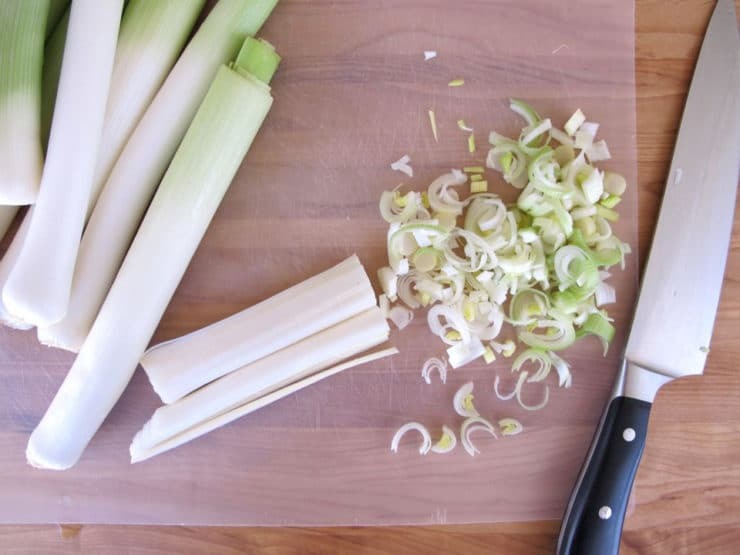 Slice the halved leeks thinly. 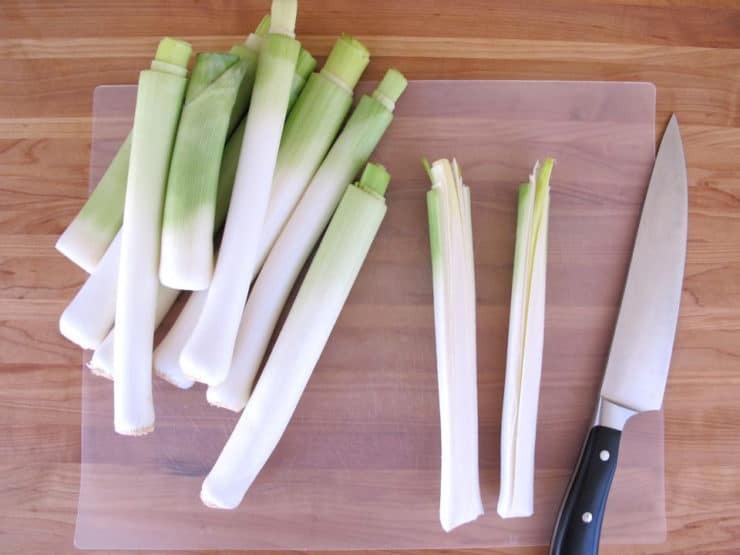 Rinse the sliced leeks thoroughly. Bring a large pot of lightly salted water to a boil. 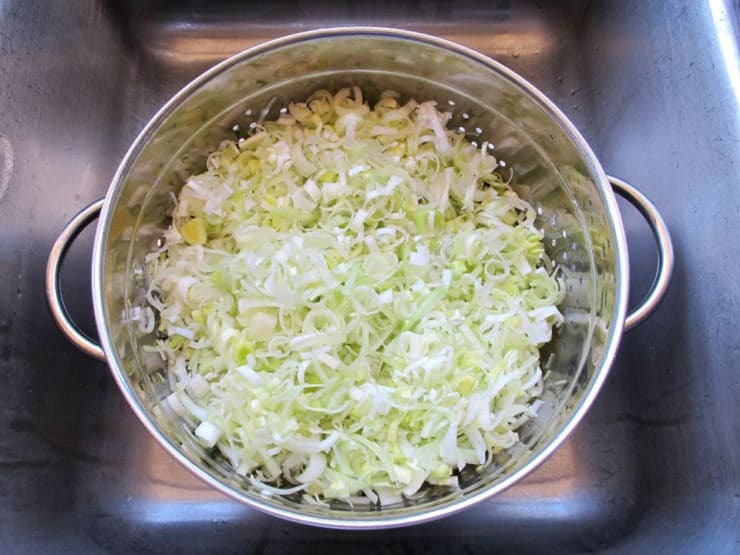 Add the leeks, cover, reduce heat to low, and simmer until very tender, about 20 minutes. Drain the leeks and let cool. Squeeze out excess liquid. 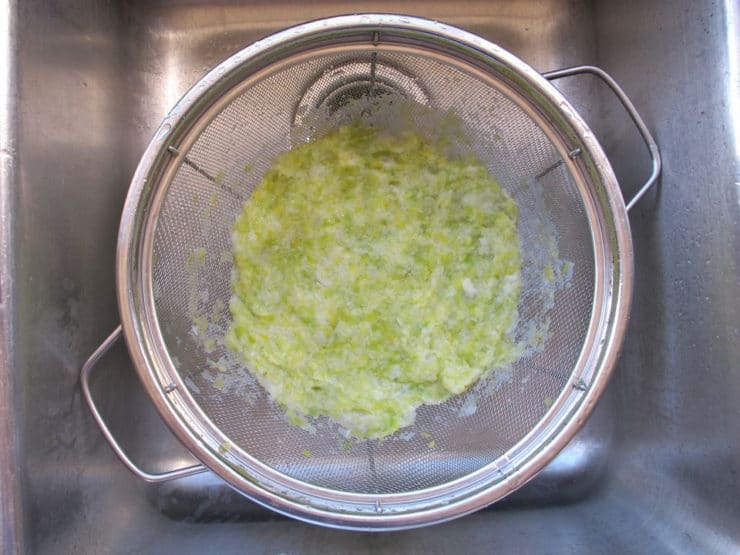 In a large bowl, combine the leeks, potatoes, and matzo meal. Add the eggs, 1 tbsp of oil, garlic, salt, pepper, and additional seasoning (if using). 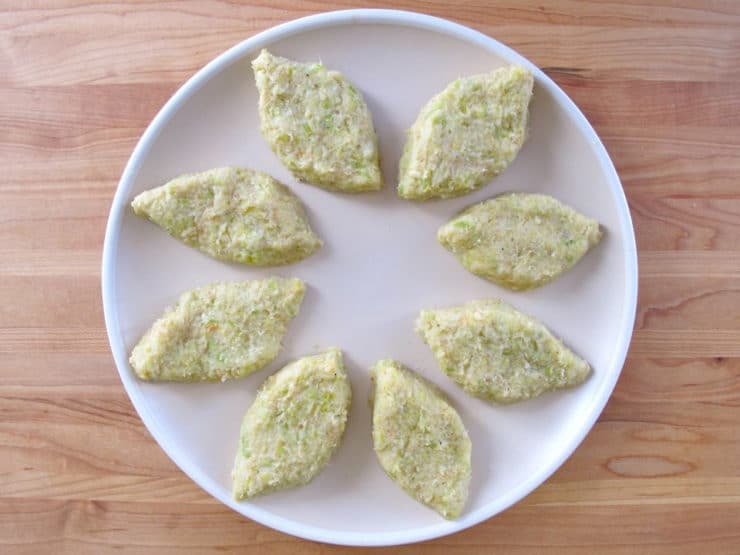 If the mixture is too soft to form patties, add a little more matzo meal or form the loose mixture into clumps and dredge them in matzo meal or bread crumbs to flatten. 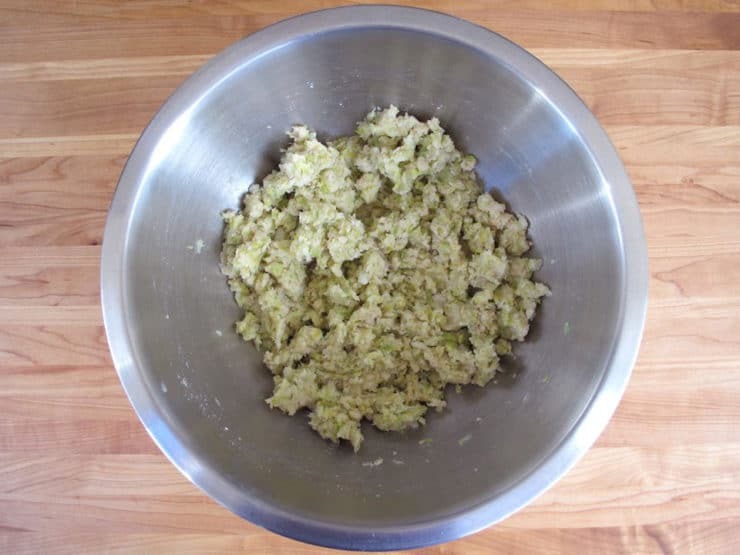 For each patty, shape 3-4 tbsp of leek mixture into an oval 2 1/2 inches long, 1 inch wide, and 1/2 inch thick, with tapered ends (like a football). 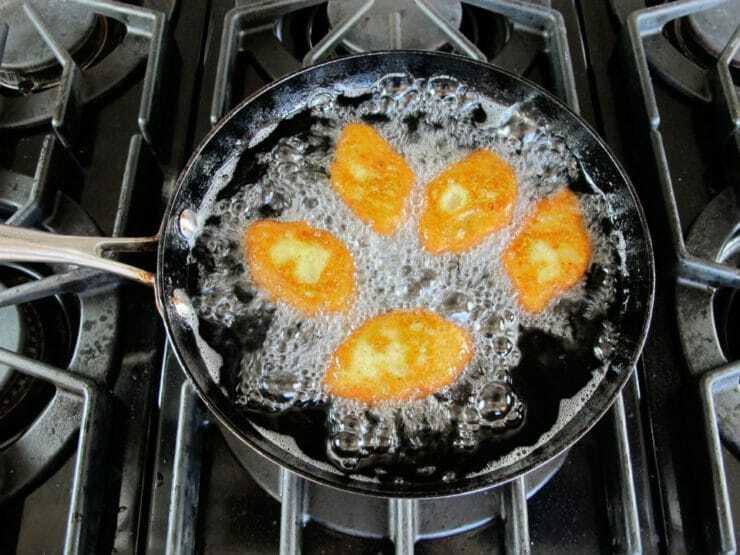 In a large skillet, heat about 1/2 inch oil over medium-high heat till hot enough for frying. Fry the patties in batches, turning once, until golden brown on both sides-- about 3 minutes per side. Drain the fried patties on paper towels. Serve hot or at room temperature, accompanied, if desired, with the lemon wedges. Thank you for your time and creativity! I will be sure to comment/rate the recipe once I’ve had a chance to make this for me and the husband! these were yummy. just like my husbands grandma made. If I make the meat option do I cook the meat before or just mix in the raw meat to the rest of ingredients and it cooks when fried? Is it possible to freeze meat option? What’s the best way to do so? Do you have a recipe for onion pie? I’m Sephardic and remember my aunt (of blessed memory) making it. Unfortunately, I was too young when she died to even think of asking for the recipe!!! It’s absolute heaven! Thank you in advance. Hi Ellice, Tori’s assistant Ashley here. Currently we do not have a recipe for onion pie, though it may be something to consider for the future! I churned out a batch of these last night, and they were absolutely amazing. I ended up making mine with ground lamb instead of mashed potatoes, and with a little luck I was able to get them all into the oil in one piece. I should also add that the nutmeg adds a very nice flavor, but now I’m curious about how a little star anise would go over. For those of you that are curious about how well they hold up in the freezer or the fridge I have some answers. They’re still delicious the next day if you have any leftovers, but they lack that delicious crispy crunch after they’ve cooled too much. That being said, I brought my leftovers into the office and people were still gladly eating them cold. Can you make them ahead of time and freeze them?? I’ve never frozen these, so I’m not totally sure how they’ll work out Mandy. I assume they’ll be okay. but likely not as crisp as they are fresh. You could try reheating them on a lightly greased baking sheet at 350 degrees F till hot. I can’t promise they’ll be as great as freshly fried keftes though. 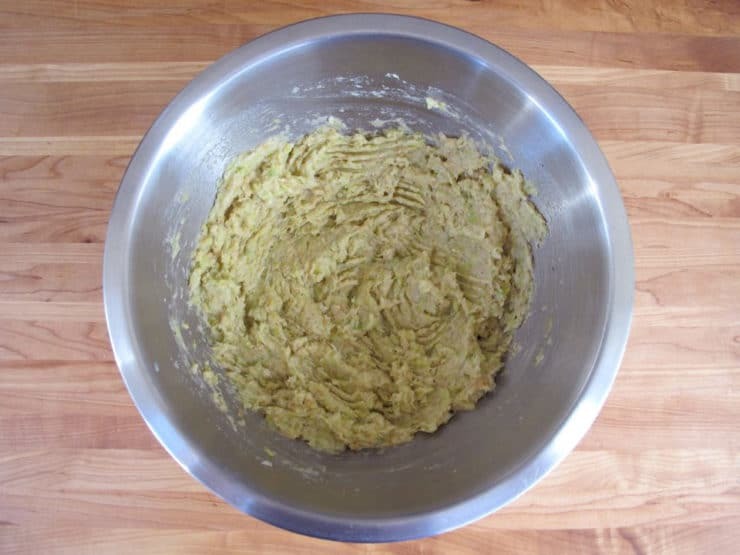 I have made this recipe for Rosh Hashanah for the past 3-4 years. I make them a few weeks in advance, freeze them, and reheat them on a cookie sheet. They still taste great! I am making this dish tomorrow for my guests. Thank you for bringing back my grandmother;s kitchen to my memory and internet. Fantastic. Gil’s recipe is brilliant. Enjoy! Hi Tori, I’m so happy I found your website. I’m always looking for kosher recipes. My son-in-law is Israeli and he loves the family to get together, especially for Shabbat dinners and holidays. He is kosher, so I try my best to honor his observance. I have one problem…. I am on Weight Watchers. I would absolutely love to make your leek patties. Frying, is totally out of the question. What are your thoughts about my crucifying your recipe by spraying the tops with olive oil and then baking them? If yes, what temperature and approximately, how long? Hi Karen– I wish I had good news for you, but I have a feeling these will not hold up well to baking. 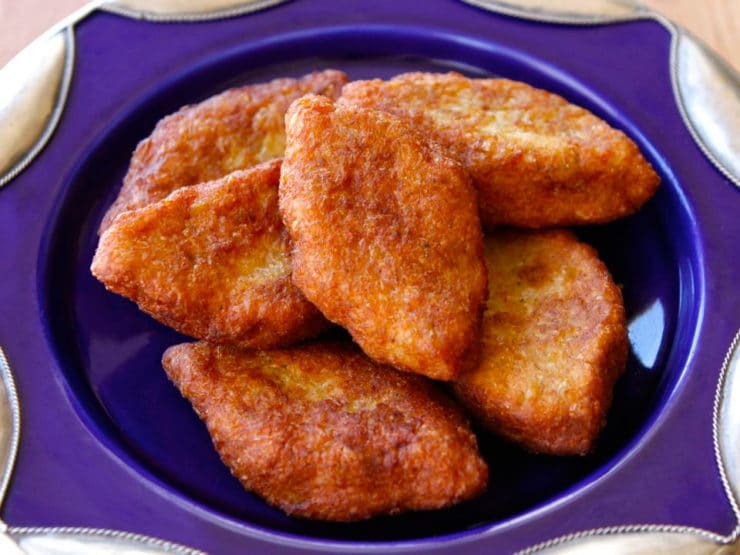 The dough is quite soft, and the frying really helps to solidify them. That said, you may be able to pull it off if you’re willing to add some extra matzo meal to the mixture. This will help firm things up and hold the patties together. If you are able to get them to a point where they aren’t soft or sticky, then baking may work. If you have a chance to try it, please report back and let us know how it works for you! This is exactly the dish my grandmother used to make. I did get her recipe notebooks but she does not describe the process in detail. Thanks to your blog, I can recreate my grandma;s cuisine in my own home. I wanted to try some new recipes this Rosh Hashanah and discovered your awesome web site. My menu will include pomegranate molasses brisket, saffron rice, and stove top tzimmes for those who are not fans of rice. Is it possible to prepare the rice and tzimmes early in the day and then reheat it before serving and, if so, what is the best way to reheat? Each of these recipes serves 8 or so people; I will be having 10 people for dinner and am wondering if these will be adequate, or should I plan to increase them? Thanks in advance for any advice you can give! Hi Marcia! The tzimmes can definitely be made early that morning and reheated before serving. 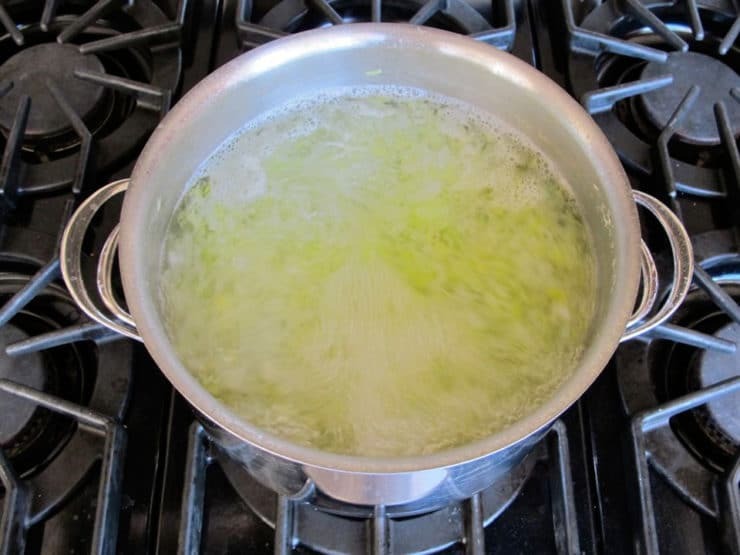 You may need to add a little liquid (broth or water) to the pan to reheat. Use gentle heat when reheating to make sure they don’t burn or go mushy on you. I don’t recommend making the saffron rice ahead– you can do it, but it honestly tastes so much better fresh. As for portions, I would make the recipes at 1 1/2 scale (1 recipe + 1/2 recipe), so that you’ll have some leftovers. Guests love taking home leftovers, and you’ll love having a little extra to snack on throughout the week. I always make a little extra so that if a particular dish is popular, I don’t run out. Good luck! Just bc I hate factual inaccuracies, bubbie meises is not “old wives tales,” that’s a common misconception. In old Europe there was a popular Jewish fiction about a Jewish knight named “bobi” or something like that. The stories were so fantastic that when people would talk about things that were crazy or unbelievable they would call them “bobi meises.” Eventually people forgot the true origin of the term and offered a new explanation for it. “1 cup mashed potatoes =OR= 1 lb. ground lamb =OR= 1/3 cup ground walnuts” ??? Surely that’s three entirely different recipes? I am so glad I found this site. Loved the article and the recipe. Leaving this week for my brother and sister in laws place north of Puerto Vallarta. She will love this as hse also has the only Kosher certified pasteleria/coffee shop in this part of Mexico!! How timely. Marks’ recipes and books are amazingly researched and so thorough. My copy of the encyclopedia just arrived on Friday. It’s a must have in a Jewish cookbook library. I concur. Looking at them makes my mouth water. Looking forward to making these for Rosh Hashanah.